It is amazing to think that that we have only been trekking for two days. When we stepped off the plane in Lukla yesterday morning it was not yet 7:00 AM. The moment was exciting and everyone was grinning from ear to ear. 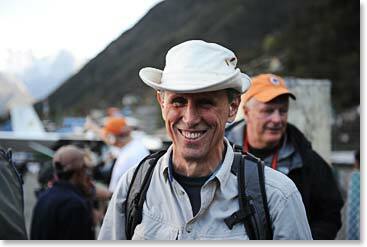 Our adrenaline was up from the spectacular short flight from Kathmandu and from the landing. This was the end of months and years of dreaming and planning for each of us. We’d arrived! For several members of this group, yesterday morning was a long anticipated return to the Khumbu, the homeland of the Sherpas. This is the fourth visit for Dennis, the third for Doc Martin and the second for several other members of this group. Other members of the team are making their first pilgrimage to Everest, but I can report that the feelings were similar for all. Unique and stimulating sights, sounds, colors, warmth in the smiles of familiar faces, it was a genuine and easy welcome into a new life. No more cars, bicycles, truck or carts. The only wheels we will use now are Buddist prayer wheels. he ordered at 7:00 am. We went quickly on the walk around the top of the runway to our lodge adjacent to the airfield. The sky was still roaring from more aircraft – both airplanes and helicopters zooming in from the opening in the canyon below. Zopiko pack animals and porters were busy moving loads from the airport. We relaxed in the lodge and several of us ordered breakfast. Doc enthusiastically informed us that the fried eggs and French fries at this lodge were outstanding. 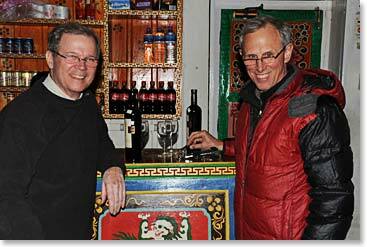 We spent two hours alternately enjoying the warmth ad comfort of lodge and then going out to watch planes come in or look up at the spectacular mountain scenery above us, with colorful prayer flags draped from steep ledges. It felt good to begin walking from Lukla around 8:30 am. The trail was busy, but there was no end of fascinating sites all around us including schoolyards full of children in uniforms playing and singing, the roaring Dudh Kosi River below us, long steel bridges which we crossed over deep gullies and small streams, and of course the mountains above. 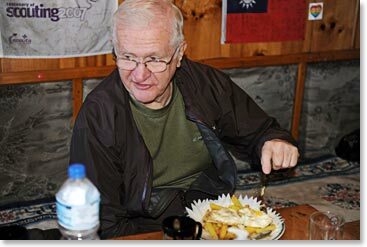 We took lunch prepared by Phuri Sherpa, our head cook, and his kitchen staff of six, about two hours walk down the trail. Ang Temba told everyone to take a rest and let lunch settle, so from around 12 noon until 1:00 we sat and enjoyed the sun through the windows of the lodge where we’d stopped. In the afternoon we hit the trail again. It was surprisingly hot in the direct sunlight. Some of us were not moving at a slow enough pace and it showed in the sweat soaked shits and hats. The village of Phakding lies at 8,800 ft/2700m along the banks of the Duhd Kosi. Our rooms near the riverbank were spacious with comfortable beds. Paul and Fred bought the wine for our first dinner on the trail and before dinner we began a tradition that I think we will be following throughout the trip. Paul and Mathes selected a reading to share with us from a small, yellowed 35 cents pocket book that has a very special history. You will be hearing more about this book and the inspirational readings that Mathes and Paul select as our adventure continues. Fred was all smiles landing in Lukla. 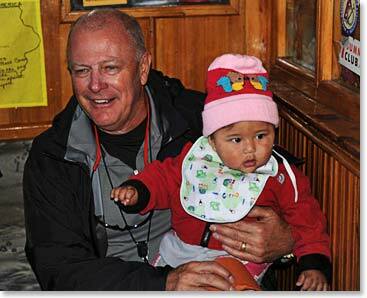 Bob made friends with the 10 month old Sherpa baby girl. 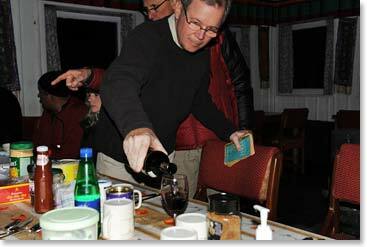 Paul pouring wine before dinner. 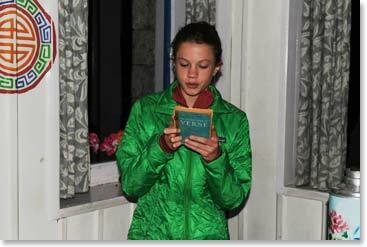 The decades old Pocket Book of Verse in his hand.